There is something in the simplicity of the invitation, play with me, that perfectly conveys the spirit of aesthetic discovery and lack of pretense within this series of works by emerging artist Cassandra Rijs. 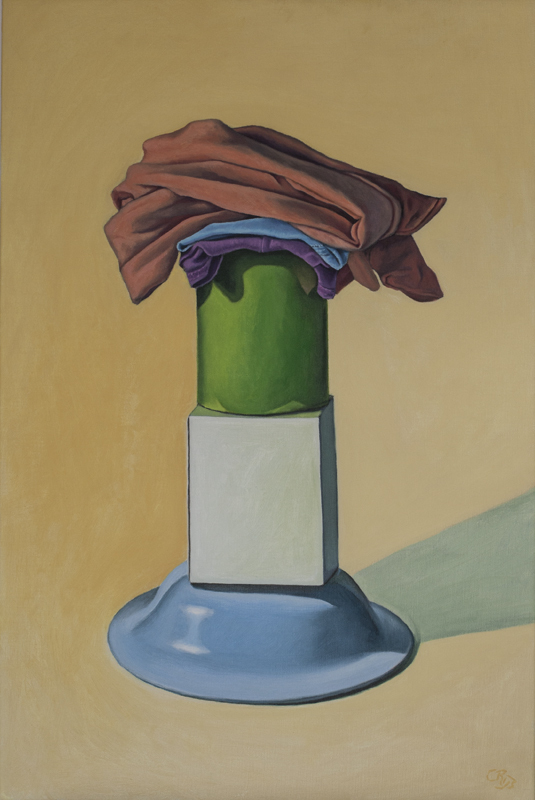 Currently completing a Bachelor of Fine Arts at the Victorian College of the Arts, what Rijs sets out to play with in this exhibition are the formal elements of painting itself. 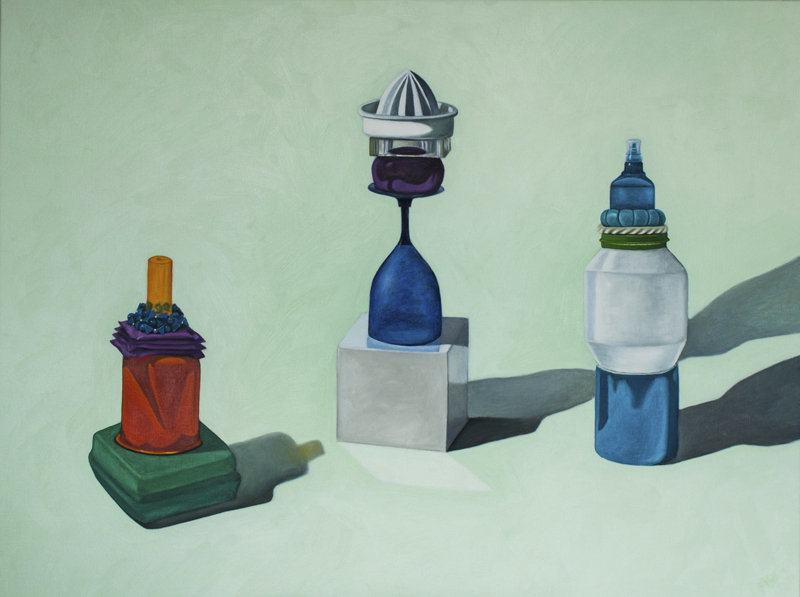 Yet underpinning her ostensibly lighthearted approach is the artist’s sophisticated use of colour, coupled with the intensity with which she observes and meticulously describes these contemporary still life arrangements. 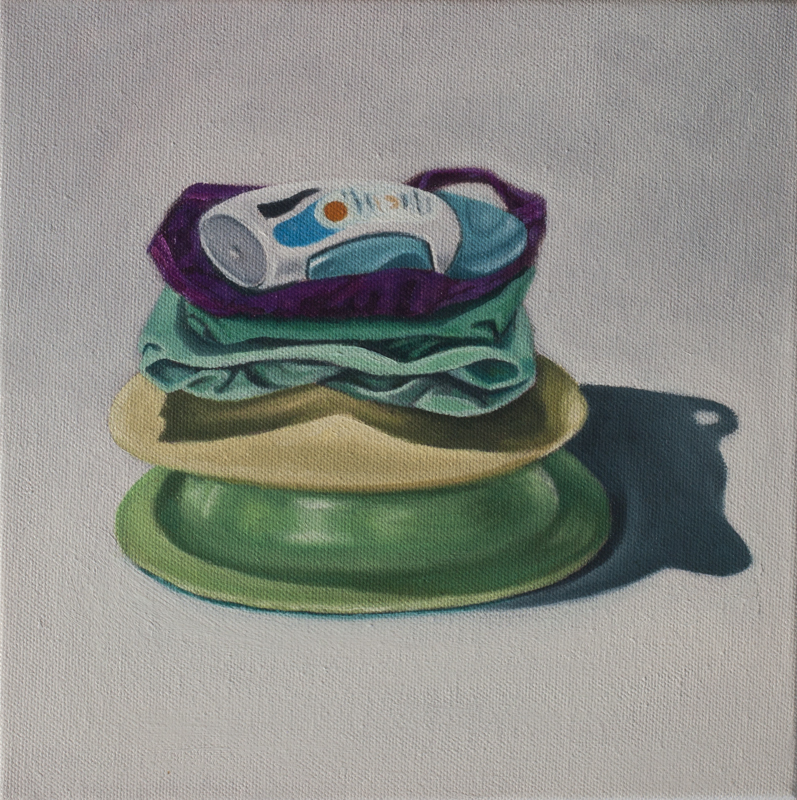 Rijs has chosen average stuff laying about the house as the subject of her painted assemblages. 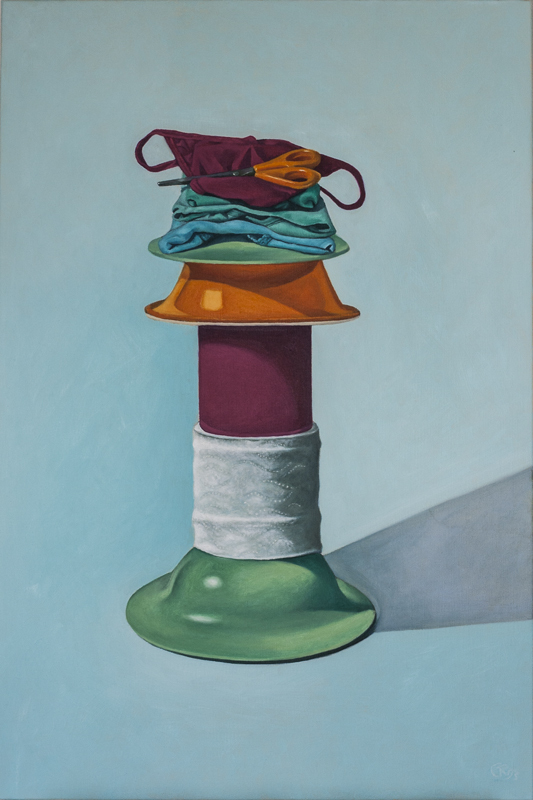 Plastic bowls, knickers, electrical cords, toilet paper – here the detritus of domestic existence has been ordered and arranged into towering totems of the everyday. In doing so she transforms objects of boring familiarity into visually exciting centre-pieces, surrounded by ambient negative space of gradually shifting tone. Vivid colour is another pronounced feature of this body of work. Instead of creating light and shade by simply adding black or white, Rijs often does so through using what’s known in colour-theory terminology as a tri-chrome system of related colours. Relying on the variety of tones available through mixing these colours she creates depth and models form while avoiding muddying her palette, and thus retains the purity of the colours used. It is this that keeps the viewer’s eye happily bouncing around the picture plane, from each well-formed object to the next. Rijs has created colour relationships in the truest sense of the term, and they are lovely to behold. 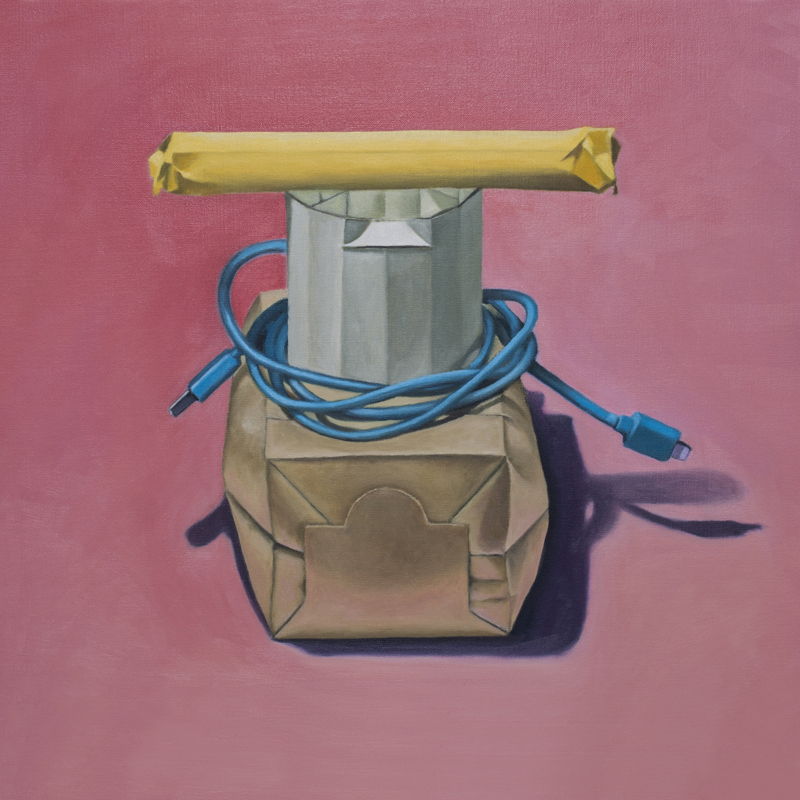 In many ways these paintings are autobiographical, a personal documentation of the objects that fill our days and fill our lives. They remind us that even the most mundane subject matter can be an abundant source of creative possibility, and inherent beauty. In this paradigm perhaps a little conscious curiosity is all that is needed to transform the world into your own private playground. Tags: art, Bachelor of Fine Arts, Cassandra Rijs, colour, contemporary art, painting, realism, still life, Victorian College of the Arts. Bookmark the permalink.